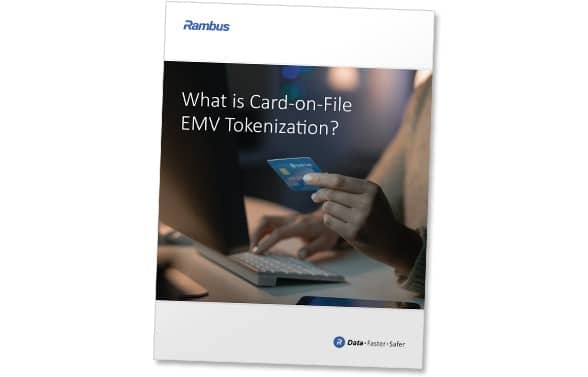 Card-on-file EMV tokenization, where primary account numbers (PANs) stored in a card-on-file database are replaced with payment tokens that can be restricted to a specific retailer, offers online merchants a way to both increase security and create a near frictionless buying experience, Rambus explains in a new ebook which is available to download from the NFC World Knowledge Centre. “As payment technologies continue to diversify across multiple channels, the ability to ‘constrain the domain’ and restrict how payment tokens are used will become increasingly important in mitigating the impact of fraudulent activity,” ‘What is Card-on-File EMV Tokenization?’ explains. ‘What is Card-on-File Tokenization?’ begins with an overview of the rise of card-not-present (CNP) fraud, the techniques currently used to reduce it and the ways in which these measures negatively impact on a merchant’s ability to create a seamless payments experience. The ebook then explains what card-on-file tokenization is, how it increases the security of online transactions and the additional advantages it offers to merchants in terms of both reducing the costs of fraud and improving the customer experience. “With EMV payment tokenization, merchants can strike an effective balance between high security and a frictionless buying experience,” the authors conclude. Readers can download the full 14-page ebook free of charge from the NFC World Knowledge Centre.